On this Website you will find the latest DS, DSi & DSi XL games that have been released. Usually the games you buy in the shops have a small memory chip inside, just big enough to put one game one it. However as you can now buy larger memory cards in most good shops, the possibility is there for around 40 games to be put on one disk, calling it a Multi Cartridge. Please if you have any issues with payment for any games, please let me know and i will see what i can do www.dubaiandy.com . plus many others - see below for details www.dubaiandy.com . Preinstalled Puzzle & Mystery May 2011 Cartridge, containing 65 Puzzle & Mystery Games, sleepness nights galore playing puzzles, hidden objects, Jewels and Mysteries for only £34.99. Preinstalled Learning May 2011 Cartridge, containing 84 Learning Games for anyone who needs a little bit of extra brsin power, enough games for everyone from kids to adults, to help at school or just a recap on your old school days, only £34.99. Preinstalled Pokemon & Mario Cartridge, containing all the released Pokemon & Mario Games all one cartridge for all you Pokemon & Mario Fans, only £34.99. Preinstalled Mario, Lego & Starwars Cartridge, containing all the released Mario, Lego & Starwars Games all one cartridge for all you Fans, only £34.99. All games are full versions. Hello and welcome back. I hope you had a great Christmas and a Happy New Year. I will continue to offer you the service that I have over the past 2 years. Please note that these games are openly available in numerous shops in Dubai as well as Sharjah, both of which are in the United Arab Emirates and are Imported in. The list of Games, that is currently available in the Shops here is listed on the next page as well as the prices. Please let me know which ones you want or send a Payment with the games noted on the payment. I can be contacted on the email address - [email protected] and my Paypal address is still the same - [email protected] for you to send a payment to me. I do ask that you pay me before I send the games. To place your order either send me an email stating which games you required and I will then send you a Paypal Invoice to pay, or alternatively send a payment direct to me via Paypal also stating the games you require. 1. Note games you require on email, if you are requesting an Invoice. 2. If sending payment via your paypal account, go to your account, select send payment, address to [email protected], enter total including p/p, make a note of games and send. 3. If sending email, I will return Invoice to you to pay. UK & Europe postage will take the around 5-9 days depending upon the weekend post. However 5 days is normal. Cost of Postage and Packing is GBA games £3.99, DS games £4.50. Postage for USA & other Countries will take longer. 1st game £3.99 (DS £4.50), 2nd and every other game £2.99 (DS £3.50) each. All games posted in separate envelopes for security purposes. On this Website you will find the latest DS/DS Lite games that have been released. As well as that there will be attached to the name of the game, this size of the game as well. I can get for you the DS Multi disk. If you would like a DS Multi Disk for your personnal use (MP3's, Movies or Homebrew Games etc) please email me as there are a few places that sell them here in Dubai, prices and delivery details shown at the bottom of this page. If you require any questions answering, please email me as before - [email protected] If you are a returning Customer, then I'm sure you will know what to do!! The following are the Pictures of the new games released - Please refer to the list at the Side for the size of the Files. Also please have a look at my other pages, where you will find reviews of the major games available. What if you could store all the games on a single Nintendo DS or DSi Memory Adapter, eliminating the swapping? The R4 adapter for Nintendo DS / DSi is a mini electronic card of tricks which is the same size as an original DS or DSi game cartridge, but also accepts flash card memory allowing you to upload files to it, which may be MP3s, videos or other multimedia files; depending upon the size of the R4 card memory, this could be dozens (to hundreds) of backed up games eliminating the need to swap game cartridges forever and allowing you to store the original games cartridges safely ensuring that your valuable investment is protected! HOLIDAYS - We all need a Holiday sometme, including me. Please note that I will be on Holiday from the 10th Aug to 3rd Sept. I can still take orders but will be unable to send until the 3rd Sept. The cartridges work on any DS, DSi or XL console from anywhere in the world, you do not need any extra software or accessories to play the multi-game cartridges. Simply insert the cartridge, choose the game you want to play from the menu and play. The games are the full complete games with all functions including multiplayer wifi and save games all on a regular games cartridge. 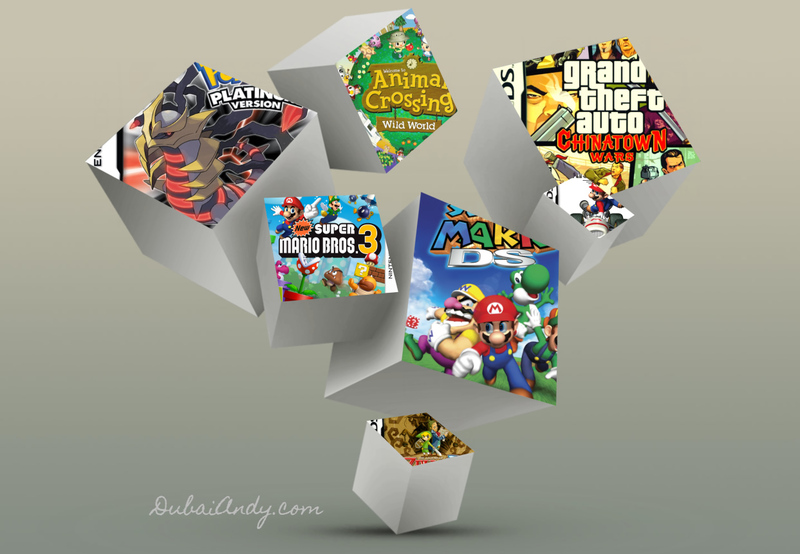 At Dubaiandy, you are buying a Single Cartridge with multiple full version games listed, The games are 100% full versions and no difference to the single cartridge games. Each of the games offered are compatible with all Nintendo DS, DS Lite, DSi and even the new DSXL. If for whatever reason it does not work, I will either replace or refund. Please remember, I always offer a 100% Guaranteed replacement or refund.